President Obama and Secretary Kerry have reaffirmed our continued commitment to building a strong partnership with a free and democratic Iraq. One of the many areas where we hope to build on this relationship will be working with Iraqi authorities to help them safeguard their citizens from landmines and unexploded ordnance (UXO), as well as excess and unsecured conventional weapons and munitions. In 2015, the United States and Iraq continued to tackle this serious humanitarian challenge, even as seizure of Iraqi territory by militants from the Islamic State in Iraq and the Levant (ISIL) further increased danger to the people of Iraq and made our work more essential than ever. Iraqis trained by Spirit of Soccer conduct Mine Risk Education in Iraq to warn kids about potential dangers from unexploded ordnance (photo courtesy of Spirit of Soccer). Since 2003, the United States has invested more than $280 million under the U.S. Conventional Weapons Destruction program toward the clearance and safe disposal of landmines, unexploded ordnance, and excess conventional weapons and munitions in Iraq. Communities across Iraq face danger from an estimated 10-to-15 million landmines and pieces of unexploded ordnance, such as grenades and artillery shells buried and abandoned from past conflicts, including the Iran-Iraq War of the 1980s, the 1991 Gulf War, and the 2003-2011 U.S.-led coalition operation in Iraq.On top of these existing challenges, thousands of Iraqi families forced to flee by ISIL have become internally displaced persons in areas of the country where they are not familiar with landmine and UXO hazards from past conflicts. As families begin to return to their homes, they are confronted with both hazards from the recent conflict, as well as deliberate mining and booby-trapping of homes by ISIL. 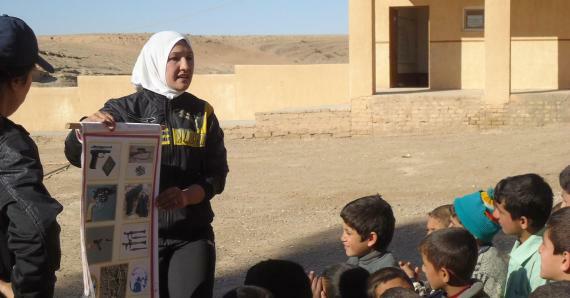 Provided risk education to more than 38,000 Iraqi men, women and children, saving lives and preventing injuries with outreach programs to warn about the potential dangers from landmines and UXO in their communities. These U.S. assistance programs, directed through several Iraqi and international non-governmental organizations (NGOs), have made significant progress toward protecting communities from potential risks, restoring access to land and infrastructure, and developing Iraqi capacity to manage weapons abatement programs independently over the long term. Through Marshall Legacy Institute’s Children Against Mines Program (CHAMPS), kids in the United States and Iraq worked together to help young Mohammad Itewi, who lost both arms to a mine explosion (photo courtesy of Marshall Legacy Institute).